KZN has a variety of upmarket boutique-style venues, as well as massive halls, intimate restaurants, country estates, sprawling beaches, and everything in-between. With such a selection, bridal couples are spoilt for choice when it comes to planning the dream wedding of a lifetime. Beach weddings take on a new magical quality along the eastern coastline of South Africa. Think white sandy beaches being lapped by the warm waters of the turquoise Indian Ocean. Durban, Ballito, Umhlanga and Margate all have gorgeous beaches on which to say your vows against these spectacular backdrops. Some of the beaches are flanked by beach resorts, which are elegant, and committed to celebrating this beach theme. The Midlands are further inland, and are characterised by verdant mountains that are laden with indigenous vegetation, their peaks reaching up to meet the high African sky. These plunge into deep valleys, or tumble effortlessly into sprawling tracts of greenery. 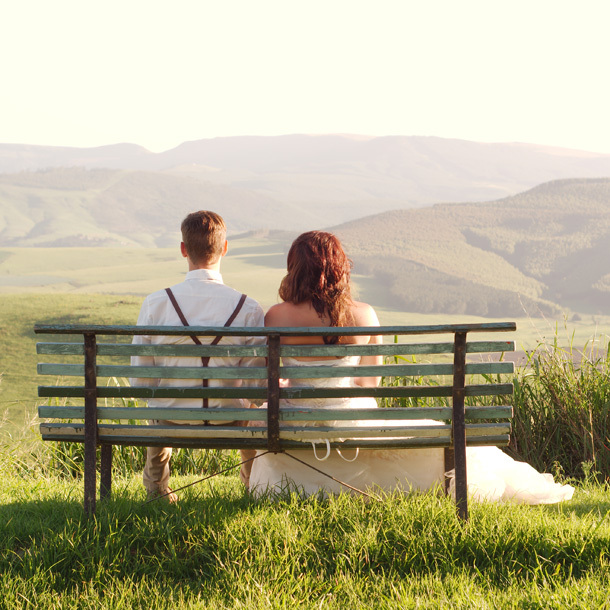 Mooi River and Caversham are just two of the Midlands’ jewels that are simply gorgeous choices for weddings. For a romantic, timeless look and feel, opt for the historical KwaZulu-Natal towns of Howick or Pietermaritzburg, or for serene venues in the Valley of a Thousand Hills or the Drakensberg Mountains. The heritage and charm of these hubs will infuse every aspect of your big day to create something really special. The Drakensberg Mountain Range and the towns within it are spectacularly scenic, and have the tranquil serenity that only a little village, tucked away amongst the craggy peaks, could exude. Of course, all of these scenically idyllic destinations mean that the couple and those most dear to them have a world of options when it comes to choosing the perfect spot for wedding photographs. This is such an important part of the day, as these pictures are the only remnants of the love, friendship and lifelong commitment made. Set against backdrops of ocean, mountain, park, or valley; your pictures are set to be nothing short of spectacular. The climate in KZN is also worth noting. It is best described as tropical, with hot, humid days and temperate nights. The metropolis of Durban experiences an average of 320 days of sunshine every year, making it a reliable venue for a summery, sunny day. The further north one goes, the more tropical the weather. Places like St Lucia and Kosi Bay are extremely hot in the days and very warm at night. In the Drakensberg, though, the climate is far cooler. The city centre of Durban is vibrant and well equipped with excellent, experienced service providers. These include photographers, caterers, designers, wedding planners, hair and beauty specialists, and so on. Thanks to the glorious surrounds and the many national parks and reserves in the region, KwaZulu-Natal is a prime honeymoon destination. It is also fabulous for wedding guests that want to extend their stay and make a holiday out of their trip to this exquisite part of South Africa.